While some nail trends come and go, I still can't get enough of the gel effect look. While it can now be a struggle finding polishes in my collection I haven't tried yet (talk about first world problems! ), the Max Factor Gel Shine Lacquer in Sparkling Berry presented itself amongst the chaos and it's a mystery why it hasn't gone on my nails until now, it's that good. I currently own three shades from the Gel Shine range. Having tried the other two: Lacquered Violet and Sheen Merlot, I had pretty high expectations that this would be just as good. While the name Sparkling Berry might suggest a glitter, it's a solid pink/berry shade with the gorgeous gel like finish. The polish applies as expected, smooth with an almost instantaneous drying time which makes it completely fuss free. There's no waiting around, so if you're impatient like me.. it's the perfect formula to go for. Just as I expected, the polish itself lasted around 5 days without any need for a top coat. Pretty impressive considering what they've gone through this week at work! 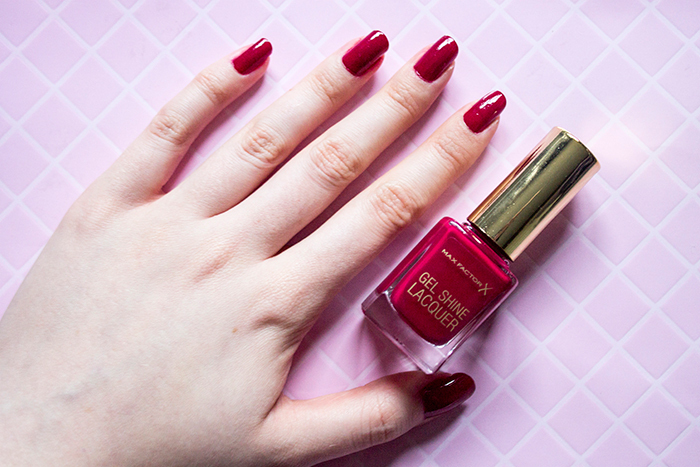 For a gel finish without the fuss or price tag, the range is definitely worth looking out for.